Fucked Up is a punk band with epic aspirations. 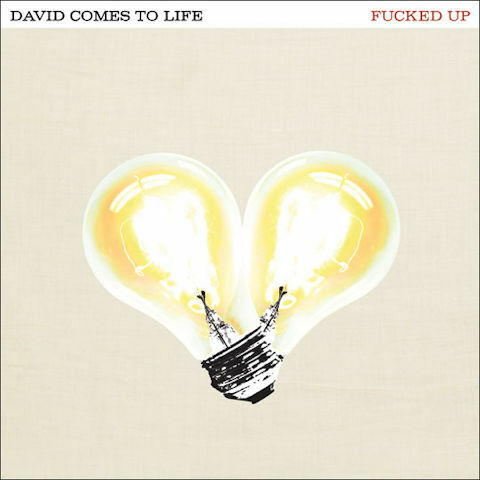 And their recently released third full length album, David Comes to Life, only serves to further demonstrate Fucked Up’s ambition. Divided into four acts, it tells the story of David Eliade, a factory worker, and his lover Veronica Boisson’s scheme to construct a bomb and the aftermath of its early detonation; namely, Veronica’s death. Beyond that, it’s difficult to decipher the plot; to do so, one would have to spend extensive time analyzing the lyrics to each track. But as a listener who still doesn’t fully understand the intricacies of the story-line of this self-proclaimed “rock opera”, I can assure you that complete comprehension isn’t at all vital to enjoyment of David Comes to Life. Besides the complicated lyrical aspects of the album, David Comes to Life isn’t an easy listen for another reason: its length. At eighteen tracks and seventy-eight minutes, the listener must be patient to easily manage a complete spin of the album in one sitting. Yet when in the right mood, one will find this album one of the most rewarding of the year. Nearly the moment David Comes to Life commences, it’s apparent this is no ordinary punk album. Opener “Let Her Rest” is an instrumental track, decorated with twinkling piano and ambient noise. To some readers, that description might bring to mind post-rock. Yet the song is more accurately defined as a dramatic build, a preparation for what’s to come; as it progresses, the guitar lines slowly become more punk, more representative of the remainder of the album. In effect, the track’s purpose is to gradually accustom the listener to the sounds that follow. The following track, “Queen of Hearts”, is the first we hear of Damian Abraham’s (A.K.A. Pink Eyes) snarl. It’s as ferocious as ever, yet Abraham seems to have improved his emotional range. It’s also the first we hear of Cults‘ Madeline Follin, who plays Veronica. The shimmery guitars grant the tune a bright feel and the dual narration is a unique storytelling technique. It’s certainly a standout and has the potential to become known as one of punk’s defining love songs. The next three songs — “Under My Nose”, “The Other Shoe”, and “Turn the Season” — share lyrical similarities in that each mention “the other shoe”. In fact, it is the track named after that lyric which succeeds the most out of the three. Beginning with Follin’s cries of “Dying on the inside”, Abraham soon makes his most tortured appearance, yelping, “It can’t be comfortable when the whole thing’s about to fall.” Far and away, this is the most poignant moment on the album. An unrelated but significant side-note is that Abraham also declares that “The new lyrics follow the same old meter.” And interestingly enough, many of Abraham’s lyrics throughout the album do follow similar rhythmic patterns. But this only serves to further the cohesiveness — characterized not only by the aforementioned but similar guitar tones and song structures as well — of David Comes to Life. That concludes the album’s first, and arguably strongest, act. Its second, however, is by no means bad. “Running on Nothing” is the highlight, with its catchy 50’s rock guitar riffing, and “A Slanted Tone”, with its brief acoustic guitar intro, is another solid tune and one of David Comes to Life‘s fastest. Despite all this, it is here and in the third act where the album drags most. It’s simply due to a couple of lesser (but still good) tracks which don’t help distract the listener from the album’s length. Yet despite the bit of unevenness in the second and third acts, it’s impossible to penalize Fucked Up too heavily, because there is just so much to explore. And because of that, David Comes to Life is an album with unquestionable lasting value. The fourth and final act is probably the second best of the four. Its only real fault is that “One More Night” is so good that closer “Lights Go Up” is a bit of a letdown. Yet the positives of “One More Night” far outweigh the negatives of the track’s placement. It’s truly an anthem. Soaring guitar lines complement accented drumming and Abraham’s violent, defiant bark until Abraham’s shouts of “I don’t wanna be right / Just one more night” enter the mix and the guitars are left to ring out. It feels so much like the album’s conclusion; perhaps that’s why “Lights Go Up” is disappointing, merely because the listener doesn’t want to hear anymore of anything. But that’s a small price to pay for such a well-conceived album by one of the best bands operating in punk music. Listen: Mount Eerie - "To The Ground"